The third game from the series of real-time military strategies (RTS), whose heroes are plastic soldiers. This time the player has to help Sergeant Sarge and the Greens in defeating the Golden ones who allied with aliens. After the success of Army Man (1998) and Army Man II (1999), developers from The 3DO Company studio decided that the series needed a breath of fresh air. Hence the idea to enrich the proven gameplay mechanics solutions with completely new elements and a crazy history. The plot of Army Man: Toys in Space continues the motifs from earlier editions of the cycle. The war between the Greens and the Golden ones took on the character of skirmishes of small reconnaissance units. The impasse situation is changed by the rapid appearance of aliens. A foreign ship crashes exactly above General Plastro's bunker. The Commander-in-Chief of the Zloty decides to take advantage of the situation, ally with the aliens and gain their technology, with the help of which he will finally crack down on the Greens. The latter, however, are the units of the Galactic Army that come in succour. In the main campaign, players again have the opportunity to lead Sergeant Sarg and his subordinates. The gallery of characters well known to fans of the series is complemented by new heroes like Tina Tomorrow and her cosmic commandos. The game is based on the mechanisms previously used in Army Man II. The player directs a troop of soldiers, which can be supplemented by buying units for the plastic acquired during the clashes with the enemy. 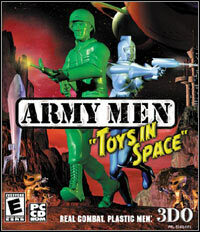 Changes introduced in Army Man: Toys in Space are primarily additional faction (aliens) and futuristic weapons. The quality of the visual setting of the game does not differ from the standards set by the previous versions of the cycle. Two-dimensional graphics are presented in isometric projection, and the player observes the action from the perspective of a third person. Game score 8.0 / 10 calculated out of 61 players' votes.